It’s hard to describe exactly what type of game My Time at Portia is. 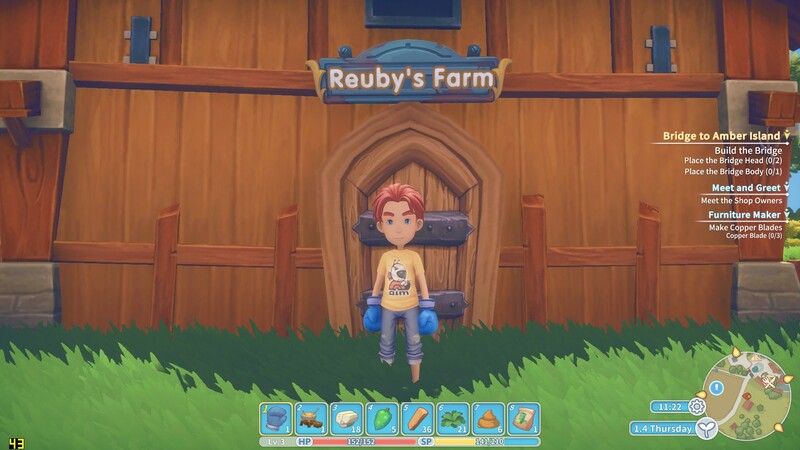 On the surface, it’s a charming crafting and farming game akin to those in the Harvest Moon series. At the same time, saying that doesn’t really do the game justice; there’s so much more to it. It puts a new spin on successful games like Stardew Valley and those in the Harvest Moon series by placing a heightened focus on crafting, building, and mining materials, while still giving players the ability to grow crops, raise animals, make friends, date (and marry) townspeople, and even fight enemies in the world and various dungeons. 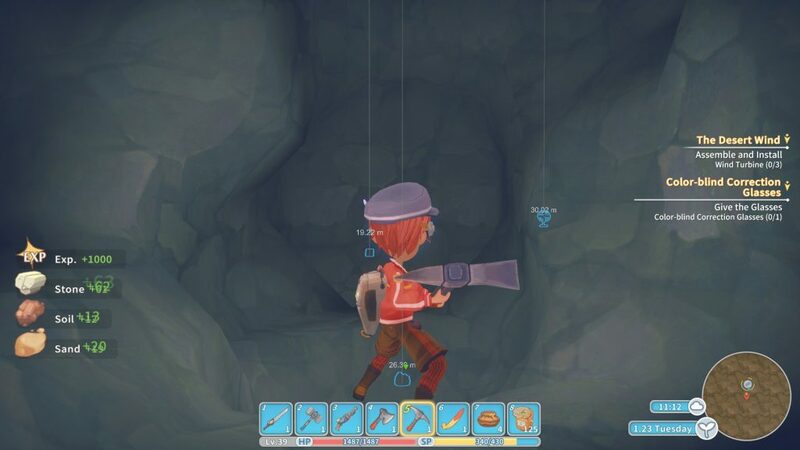 My Time at Portia has a little bit of (almost) everything, and it does nearly all of it well. As is the case in many farming/crafting/life-simulators, you arrive in Portia a newcomer who has inherited a rundown operation from your Pa, and are tasked with returning it to its former glory (and beyond). In this case, that operation isn’t a farm, but a workshop. You take on the role of a “builder”, which in Portia means that you take on commissions from the Town in exchange for pay (and workshop rank, which I’ll get into later). Other townspeople and organizations may need assistance from time to time as well, which provides the player with a steady stream of jobs to do, even leading to difficult choices at times – do you take on a large commission from the Town? Or do you focus on that big project you just promised to a fellow citizen in hopes of improving your relationship? 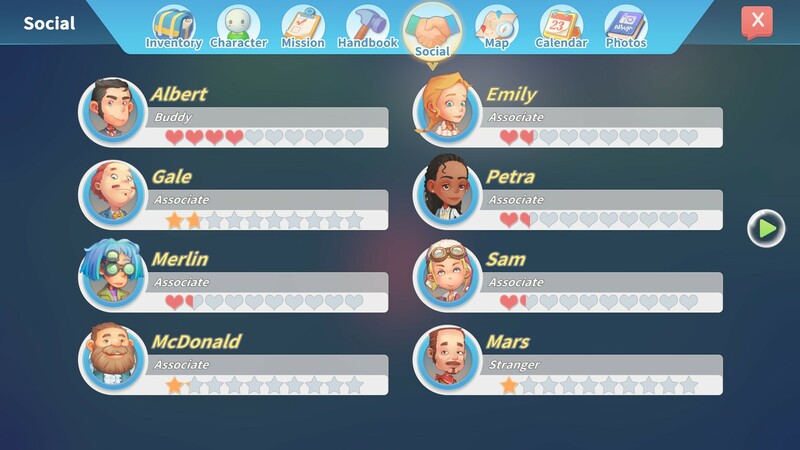 My Time at Portia provides options, and it’s up to the player to choose. And don’t go thinking you can just leave everything for later – if you don’t take that big commission for the Mayor, one of the other builders in town will surely snap it up. 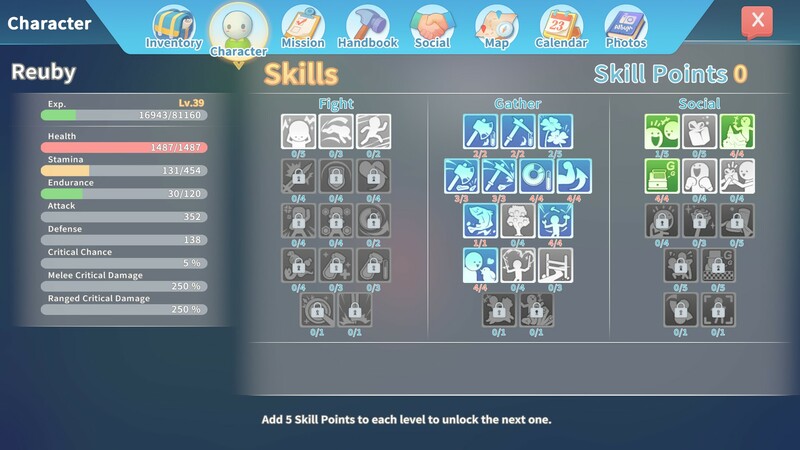 You see, in Portia, there are several competing workshops, and completing commissions is how you gain workshop rank. If you manage to climb the rankings and be among the top 3 workshops at the end of a given month, you’ll get a prize. This is just one of many incentives to progress in the game. I found that as I played through the game, my own motivations changed over time. At one point I was highly motivated to progress the story. At another I wanted to take big commissions and become the #1 ranked builder in town. Later still I wanted to enhance my crafting ability and see what other cool things I could build. I think that’s what hooked me about My Time at Portia: there was always something to work on, and it wasn’t necessarily always the same type of thing. Breaking it down, there are several different ways that you can measure “progress” in My Time at Portia. Your crafting ability, the level of your workshop and buildings, your builder rank, or story progress. On top of all this, an infusion of role-playing game elements gives a sense of character progression that overarches all of the other pieces. You can choose to focus on upgrading your mining abilities, combat prowess, or even your social skills. It all depends on what you care most about, and how your character develops will help you play the game in your own way. Pathea Games has created a beautiful world, and I absolutely love the graphical style of the game. 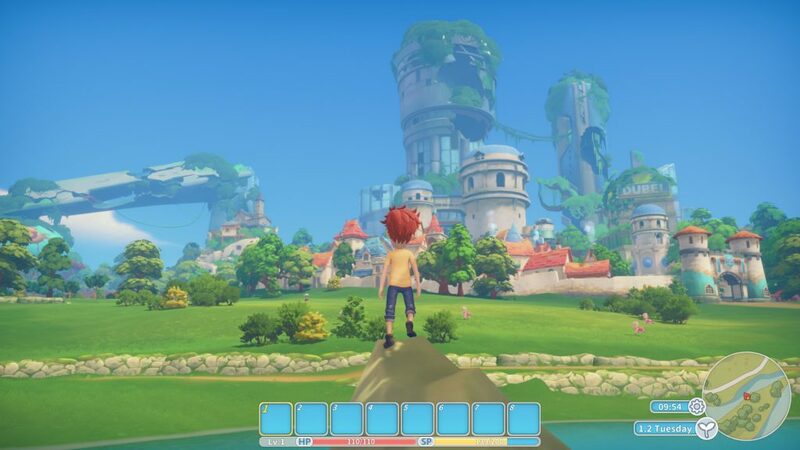 The town and its characters are charming and cute without being overly so, and for me the game struck the perfect balance; not too “cartoony”, but not trying to hard to be realistic either, which helped me get immersed in daily life in Portia. The town and world are quite large without being overwhelming, as you start with only a small portion of the map accessible, and additional areas unlock as you progress through the story. The world and character design engaged me and made me feel attached to both my own character and others in the town. When presented with a side quest, I often felt compelled to undertake it in the interest of helping my fellow Portians. This is a key component in any game of this nature, since if you don’t feel connected to the characters and world that you’re interacting with, it’s difficult to maintain interest. Thankfully, after roughly 60 hours with the game, I can say that’s not at all an issue. Festivals, events, and minigames offer ways to feel like a part of the community, and can provide you with special items ranging from clothing to crafting materials to things to put in your house. Yes, that’s right, you can decorate your house with furniture and items that you collect, purchase, or craft – and some of them even provide stat bonuses like additional stamina or health. Your house is also where you save your game – you can only save by sleeping in your bed. This was an annoying design choice, as there were many times over my roughly 60 hours with the game where I needed to exit the game, but was halfway through a day and felt as though sleeping until the next morning (you always wake up at 7:00am) would essentially be a penalty, causing me to fall behind on commission deliveries or mission progress. There are occasionally some janky moments where NPCs don’t behave as expected, or events don’t seem to be triggered properly, or other similar weirdness, but I found these to be relatively minor annoyances. I never experienced any bugs that prevented me from progressing as intended, or that wasted any of my time or effort. The movement feels a bit jerky and clunky at times as well, but again this was rarely, if ever, a real frustration. Some voice acting is still missing, however Pathea Games has indicated that they intend to add in the remaining pieces in the future. That being said, it should be noted that during its Early Access period there were reports of poor treatment of the game’s voice actors and issues with payments, however it appears that these issues have since been resolved. The UI is fairly well designed, showing just the absolutely necessary information without being overbearing. Inventory management is relatively simple, and it’s easy to set your most-used tools and weapons to quick-select buttons for speedy switching, which can be particularly useful in combat. There are a range of weapons available, as well as a host of clothing options that provide different defensive and other bonuses. Many of these can be bought or crafted, so if you don’t feel like taking the time to mine materials for that new sword, you don’t have to. And you’ll want to ensure you’re well equipped when you head into the game’s dungeons. 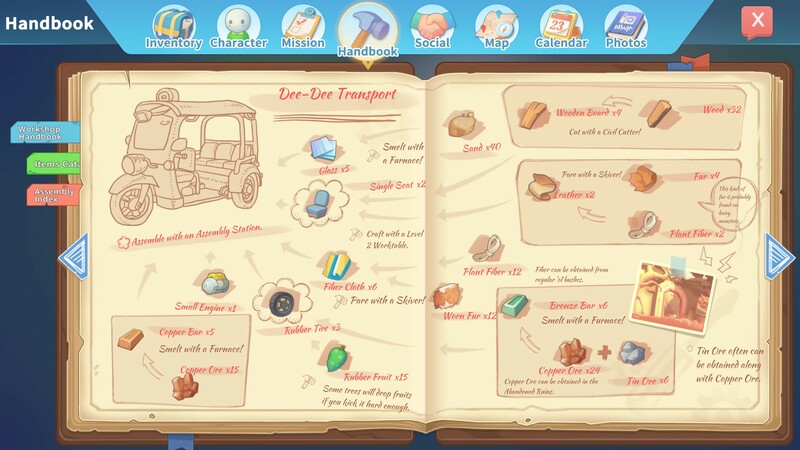 Dungeons in My Time at Portia serve different purposes – some are part of the story, while others are areas to be used repeatedly for collecting materials. 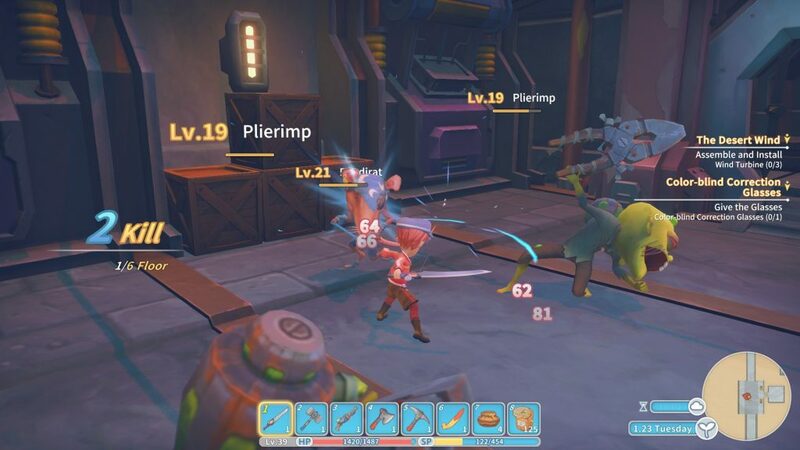 However, the combat in My Time at Portia is the one component of the game that fell flat for me. There is very little variety in enemies and their attacks, and more often than not I found myself simply clicking furiously to swing my sword as quickly as possible, rather than taking any strategic approach. Dungeons seemed to simply be a means to an end – a way to get the player to mine for materials without forcing them to, well, mine. I met some difficulty at first, but once properly leveled and equipped, it was easy to breeze through an area and collect the materials I needed – bosses didn’t even present a challenge. While it does stand to reason that challenging combat doesn’t need to be a key tenet of the game (given that it focuses heavily on crafting and farming), the fact that it’s included but not well-developed made it feel a bit like an afterthought. Mining for materials is somewhat repetitive as well, though repetition is to be expected in a game based around crafting and farming. I thought it was clever how different materials could be found in different “ruins”, and depending on what I needed, I’d go mining in a different area. 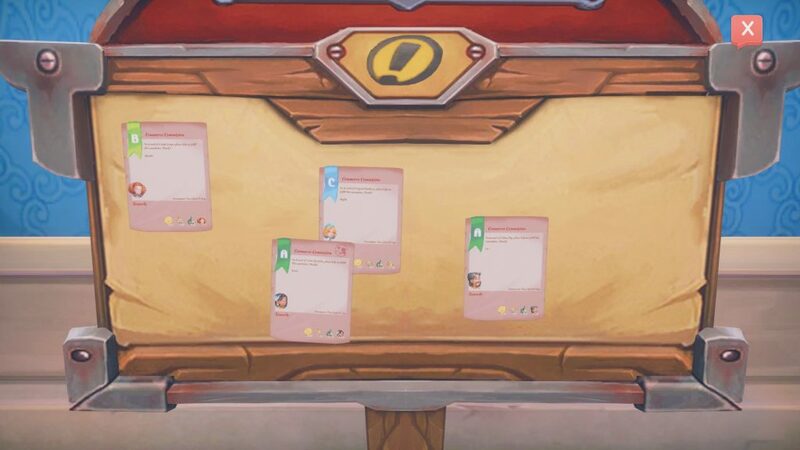 This was also a good way to slowly introduce new items and crafting possibilities to the player, avoiding the potential for confusion by not throwing every material in the game at them (and their inventory space) right from the beginning. However, this did require a good memory later in the game, when I’d have to recall which ruin gave me manganese ore, and which gave me iron ore (for example). While mining, you can also come across various artifacts, which can be pieced together and sold or placed in the town’s museum. The crafting system is quite deep, requiring the player to understand the appropriate uses for quite a number of different machines and tools, all of which generate different types of finished (or semi-finished) products. Sometimes you need to craft multiple smaller items to create a more complex one, to then use that item in your final build. This requires planning and foresight to efficiently produce the right materials that you’ll need for your big projects. And some of the projects are indeed quite large. This is where My Time at Portia really shines. As a builder in Portia, you’re expected to take commissions from the Town and other businesses in it, which are posted daily on a board. Some of these projects require a large number of highly processed materials to build, and may take days to complete. This part of the game really hooked me. I immensely enjoyed figuring out new and better ways to craft materials more quickly and efficiently, adding new equipment if needed, or producing certain materials during slow times even if I didn’t need them yet. The cycle of mining, forging, and building was extremely satisfying, and it was interesting to see things that I considered “big” projects near the beginning of my playthrough turn into things I could craft almost at a moment’s notice later on in the game. The actual construction of large items is visually satisfying as well, as you have an assembly station where you manually add all the components for a given blueprint (which are all catalogued in a handy book) until it is finished. There were several times where placing the final piece on a large item felt like I’d accomplished a major milestone, even if it was only a piece of an even bigger project. 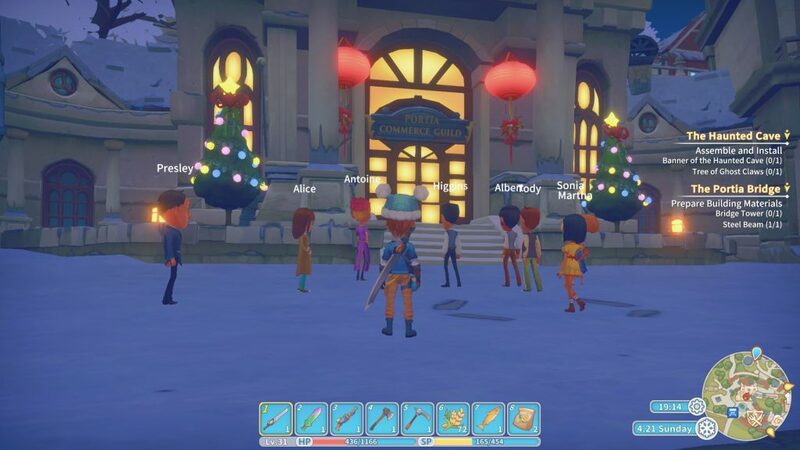 This is yet another way that My Time at Portia does an excellent job of keeping you engaged and excited about what you’re doing in the game. What constantly kept me going was the hook of knowing that if you make just a little more money, or do a little more research, or progress the story a little more, you can improve your workshop (even by automating production!) and learn to build even bigger and better things. When you’re not crafting, building, or gathering more resources, you can spend time getting to know your fellow Portians. Spend enough time doing so, and you’ll see them grow from acquaintances to best friends, and maybe you’ll even marry one of them! There’s a big focus on the relationship building in the game as well, so if that’s something you’re into, you’re in luck. If you’d rather not spend your time on that, that’s ok too. The game doesn’t punish you for not choosing to partake in the local social life, but you might find some added bonuses that come with having friends! My Time at Portia is an incredibly addicting, engaging game. Set in a beautiful world full of charming characters, with a myriad of things to do, any fan of farming or crafting games is sure to have a great time, for a long time. While the combat fell flat and there is some occasional jankiness, overall this game is a fantastic package that has a ton to offer players looking for a game to scratch that farming/mining/life-simulating itch. Charming, deep, and most of all, fun – I’ll be spending my time at Portia for quite a while.